DHFW Notification is out. 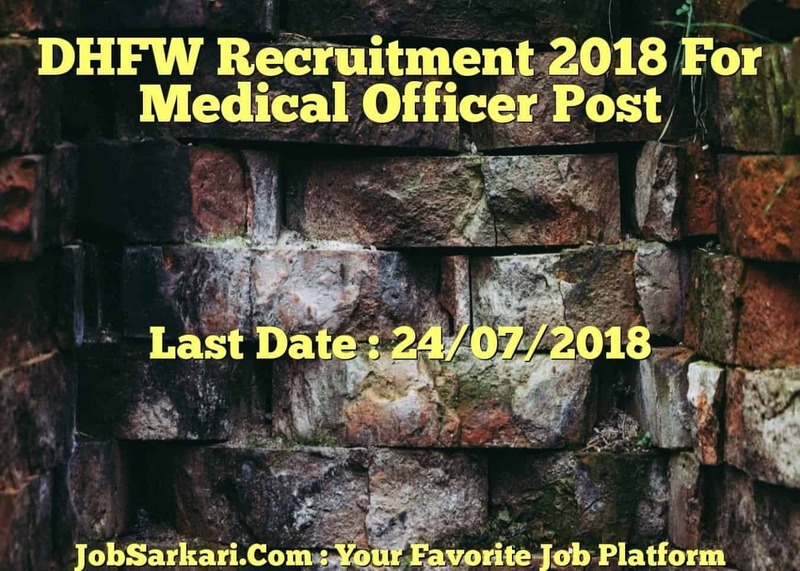 DHFW is recruiting for 1696 Medical Officer Post Posts. You can check DHFW - Department of Health and Family Welfare last date, download DHFW notification, visit DHFW official website and check other DHFW Vacancy details.Complete Vacancy and recruitment Details about 1696 Medical Officer Post vacancies in DHFW are provided below by JobSarkari.Com only for you. Last Date For Apply Online 24/07/2018. Walk in Interview For 513 Vacant Posts. Anesthesia. 28. 10. 21. 01. 60. 138. ENT. 12. 00. 02. 00. 14. 48. Surgery. 27. 09. 27. 01. 64. 242. Gynecology. 02. 08. 27. 01. 38. 254. Medicine. 29. 10. 30. 00. 69. 253. Ophtalmology. 12. 00. 01. 00. 13. 75. Orthopedics. 07. 01. 13. 00. 21. 83. Pathology. 01. 03. 10. 00. 14. 95. Pediatrics. 60. 20. 40. 01. 121. 290. Psychiatry 15. 04. 11. 00. 30. 80. Radiology. 26. 05. 15. 00. 46. 69. Skin & VD. 08. 00. 04. 00. 12. 37. TB & Chest. 01. 01. 09. 00. 11. 32. Total Vacancy. 228. 71. 210. 04. 513. 1696. Medical Officers. Candidate Must Have Passed MBBS Degree And Having Post Graduate Degree And Having Registered in Punjab Medical Council or With Any Other. Age Relaxation. 5 Years For SC/BC And 10 Years For PH. 3. Candidate Have to Fill All the Details. And Download Complete Application Form Before 24th July 2018. 4. Candidate Need to Go For Walk in Interview For 513 Posts with All the Mandatory Documents Like Cast Certificare, Age Proof, Address Proof With Application Form. 5. Candidate Need to Go On Given Address on 27th July 2018. Q. What is the Last Date For DHFW Medical Officer Post Vacancy ? A. 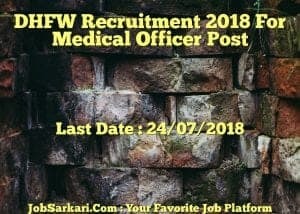 Last Date for DHFW Medical Officer Post Posts is 24/07/2018. Q. What is the Form Type of DHFW Medical Officer Post Recruitment ? A. The Form Type for DHFW Medical Officer Post Posts is Offline, Online. Q. How many vacancies are available in Department of Health and Family Welfare Medical Officer Post Posts ? A. There are about 2000 Vacancies in Department of Health and Family Welfare Medical Officer Post Posts. Q. What is the Full Form of DHFW ? A. Full Form of DHFW is Department of Health and Family Welfare .